I’m really excited after a nice long Christmas break to be back on the beauty track and talking about new launches and skincare discoveries in 2016! There are several really good ones that have already landed on my beauty desk this month and in the midst of winter, I want nothing more than to talk about (and apply) the most nourishing and beautiful skincare products there is on my face. So first up, let’s talk about Vivderma Perfecting Facial Oil (RRP £65.00). This is a beautiful facial oil that is great for winter and nourishes, moisturises and hydrates instantly by penetrating into deep into each layer of the skin. This product is meant to be used in the evening, when your skin is on ‘repair-mode’ so it’s best to use at that time. It targets fine lines especially and that dullness that tends to happen to your skin the winter. You know what I’m talking about – sallowness. This feels great going on and feels especially luxurious before bedtime. Along those same lines of talking about dullness and just in general not-so-nice skin, we move on to Filorga Paris Scrub & Mask. This is a reoxygenating exfoliating mask and it’s totally 2016. This feels very next generation – what it does is first exfoliate skin (you apply to cleansed skin and massage gently). Then you leave the scrub to settle and it turns into a bubbling mousse in which fresh oxygen is released into skin, allowing ‘suffocated’ skin to breathe. It comes in a very nifty jar as well – you simply press down on the top and the product comes out. This is to keep it fresh so when you apply it to your skin it will do it’s job as though you just opened the bottle. You can see what the formula looks like below. I found this to be a very gentle exfoliator to my skin and it works great as a quick fix – making your skin instantly brighter and smoother so perfect for once or twice weekly treatments. And what do you do about wrinkles that don’t seem to budge? Well in the worse case scenario use a primer to smooth them out during the day. 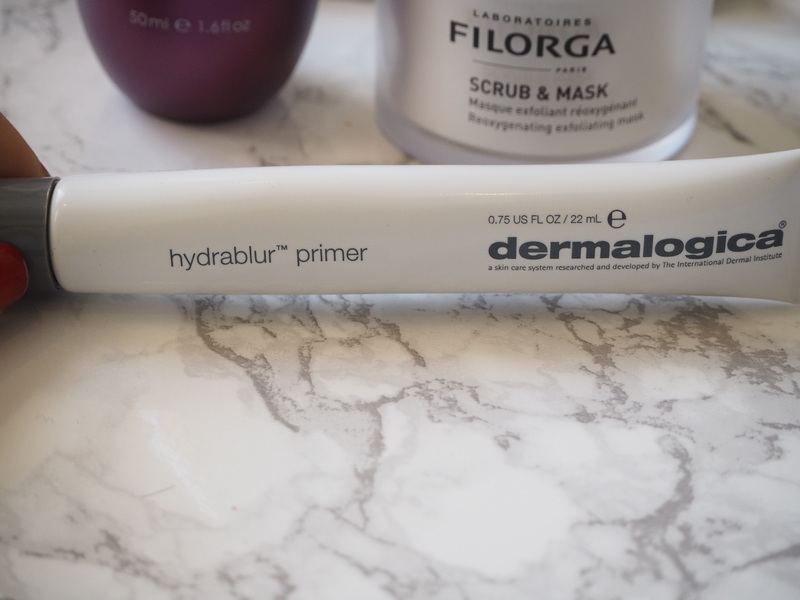 I love every single product that Dermalogica has ever released and this one is no different. Their primers are amazing and this NEW Hydrablur Primer (just launched!) is fantastic at mattifying skin, filling in and perfecting in general. I really like to use this under my eyes for pesky fine lines. And the great thing about this primer as that it is anti-ageing as well so it is targeting wrinkles while hiding them. This is FANTASTIC for oily skin! You can see the formula below – it comes out as white but blends in and mattifies right away. Talking about instant fixes I am loving Instant Effects! I am giving you a first peek here as these products don’t launch until February into Selfridges, Fortnum & Mason and British Airways. I’ve got the Instant Eye Lift, Instant Lash Volumiser and Instant Lip Plumper – all really reasonably priced (around the £24.95 mark). The Instant Eye Lift immediately targets the signs of ageing around the eyes and it is a really lovely rich balm that smooths out the fine lines around the eyes. It also works on dark circles and puffiness in 15 minutes so you can see why they are planning to sell these on British Airways. It is great for a quick fix – I really like it a lot. As you can see below, it’s a gel/balm formula that really smooths over fine lines, much like a primer. When I used it, I mostly noticed that fine lines were smoothed out and my eye area in general did not seem so sunken in. It works because of a high value of molecular proteins that create an immediate and perceivable effect. In regards to the Instant Lash Volumiser (you can see below) that the wand is great for grabbing lashes and really pushing them up. This works on your lashes in two minutes and you can also use it on your eyebrows which I was thrilled about! If you continue to use it, it will also aid growth and lashes appear up to 20% thicker two minutes after application. The great thing about this is that you can apply mascara directly two minutes after. But my favourite product of the three is the Instant Lip Plumper. The reason I love this product is that it actually does plump lips and it doesn’t sting or contain any peppermint oil or anything either. You get fuller lips within two minutes flat and it increases the volume of your lips by up to 20%. And guess what? The effects can last up to four days! I used this and was really impressed. I think my effect lasted two days but honestly I am happy with that. In the below picture I have used all three products for the eye area, the lashes and the lips. Compare this to a previous picture I took using very similar make-up the day before (below) – I think my lashes do look longer and my lips are definitely more voluminous in the top pictures on the day I used the Instant Effects products. Another really cool product I have stumbled across this year is still all about beauty – just in the form of chocolate! I eat chocolate every single day so I was very excited to discover that I could eat it as a skin supplement with Esthechoc. Each bar contains only 38 calories and one small esthechoc a day helps to regain your skin health and slow down the ageing process – the result of 10 years of research! I did wonder if this chocolate would taste any different to other dark chocolate but it doesn’t – it’s delicious. It contains a combination of highly potent active substances: Astaxanthin (the most powerful antioxidant known to science) and Cocoa polyphenolic epicatechins (found naturally in chocolate). What really intrigued me about this supplement is that it contains Astaxanthin, which can be found in seaweed and which we know has been in the East Asian diet for years and is incredibly healthy. And what really surprised me was that one bar of the chocolate contains the same amount of Astaxanthin as 10Kg of raw seaweed. Honestly! So if you are thinking about eating lots of seaweed for good skin health, stop and eat chocolate instead! Available online and exclusively at Harrods. Previous Post Maybelline New York Latest Launches for 2016! Next Post A Sneak Peek at NEW DHC Beauty Lift Range Before Launch!